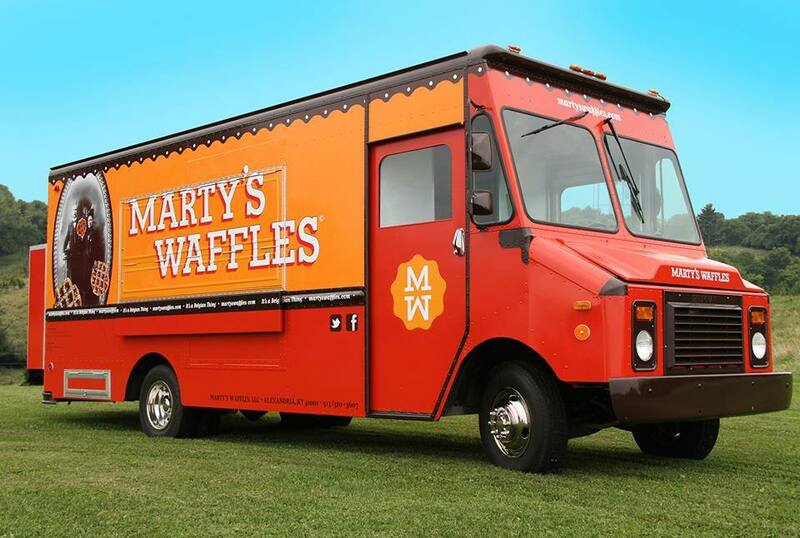 Congratulations to Marty’s Waffles on winning the 2014 Best Food Truck Graphic Design. Relatively new to the Alexandria, KY market, they’ve made a big impact. When their bright red truck rolls around town people know there’s some home cooked goodness aboard. Marty Meersman, a sculptor and former art teacher, has always had a passion for baking. 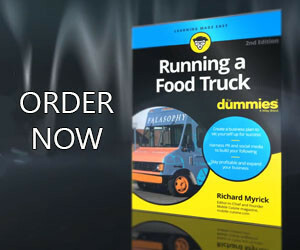 Throughout his marriage to Julie Mader-Meersman, almost 18 years, he wanted to run a mobile food operation. He was always passionate about baking. A few years ago, his children gave him a waffle iron his birthday. Marty dug into his Belgian heritage and became obsessed with making the perfect waffle. After nearly 2,000 attempts, he was finally satisfied with the Liège-style Belgian waffle, a sweet, doughy, yeast-based waffle. He was happy with this recipe and he started sharing them with everyone. It was at this time that the Marty’s Waffles food truck “found them.” He started working on it slowly with the help of a former student and now friend, Pete Hall. As the truck’s interior came together, Julie stepped in to put her creative mark on it and gave the truck an identity. This is what she does. Julie is a full-time professor of visual communication design and owns her own studio, Originalia, where she does freelance design and creates her own art. I asked about her initial inspiration for the branding of the truck. “My first point of inspiration for the design was Marty himself. There is so much depth, care, whimsy, subtlety and artistry that he puts into his food.” He’s a man that cares about creating and giving memorable experiences through his food. The truck had to convey a sense of uniqueness, friendliness, and be indicative that there’s something special inside. Julie treated Marty like any other client. She made him complete a questionnaire about his business objectives. He stated, “I want to share my food passion… and create an experience that needs to be shared with others.” He wanted to convey his sense of sincerity and honesty with a playful and amiable presence. Before Marty’s father passed on, he gave him some family photos. A spectacular photo of Marty’s Belgian great-great-great grandparents, Ino and Mathelde Hooste, are pictured on the truck. This is a nod to Marty’s family and their influences on his food and passion today. Julie used colors that were appealing and appetizing. All of the colors are compatible with the food itself and convey feelings of happiness. The red and orange, espresso/syrup brown and white all coordinate with the palette of the food – the fruit, chocolate and sugar. They’re combined to express both fun and sophistication and are reprographically versatile. She built the wordmark and monogram seal from a typeface used in a vintage typewriter ad. The shape of the seal itself is meant to be a stylized waffle. The overall design has both a fresh and retro vibe – new, but inspired by the good ‘ole days – with Marty’s ancestors holding waffles that grow out of the photo and are sprinkled across the truck. Since both Julie and Marty have taught art and are active artists, they wanted to work with Advertising Vehicle Graphics to create the “huge stickers” that went on top of Marty and Pete’s paint job. AVG employs several of Julie’s former students including Tama Wagner and Shelley Ruffing. Coincidentally, another former student and current AVG member designed fellow Cincinnati food truck, Urban Grill, that came in third place in this year’s graphics competition. Sounds like there’s an incredible artist community in southern Ohio – along with some fantastic food. Holding both a BFA in Graphic Design and MFA in Visual Communication, Julie has 23 years of experience working on a wide range of projects for a wide range of clients, including design, art direction, and project management encompassing the entire creative process… but this was her first food truck!! She also does a lot of experimental artwork including collage and artist books. Some of her work can be seen on her website, Originalia.org. She loves a design challenge and likes to get behind projects with social meaning and impact, regardless of the medium. “People always undersell and undervalue the arts and art education. This whole experience has highlighted to us that the ideas, insights, skills, approach to experimentation, and technical know-how that art and design can bring to business is real, tangible and matters. There are so many applications for the skills that come from the close study of art and design – even outside of any gallery context – into the entrepreneurial realm, like this company,” reflected Julie. 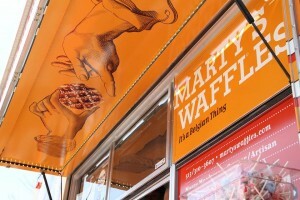 Congratulations on this incredible design that truly reflects the passion, heritage, and joyful experience that is Marty’s Waffles.